Being a ‘fan’ of the Black Metal scene since the end of the eighties, I came along a handful of mostly interesting bands or projects from Malta, a small island in the Mediterranean sea, in between Italy and Africa – think: Martyrium (Draugûl-frontman Vargblod used to be in this great act for a couple of years, by the way), Apotheosis, Sahhar or Sandmist. Recently German label Pesttanz Klangschmiede did send us two albums by Draugûl, a one-man project that originates from Malta as well. The guy behind Draugûl, who calls himself Hellcommander Vargblod, moved over to Sweden in mean time, but his roots are Maltese. 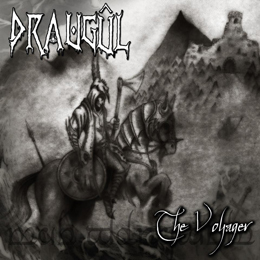 With Draugûl, Vargblod released a first album in 2013 and a second one in 2014. This review deals with the one released in 2013; the 2014-album Tales Of Loot And Plunder will be reviewed and posted on the site in a very near future. The Voyager was recorded at the Minas Morgul Studio (the home studio of this guy) at the very end of 2012 (hey, ‘draugûl’ and ‘minas morgul’, it reeks of Tolkien-worship!). This fifty six minutes aural journey consists of ten tracks that were completely done (written, recorded etc.) by the sole member, the commander of the underworld Vargblod. It opens with Bûrgûlob-Agh Ghaash, a very short introduction with some keyboard lines and spoken words. It is a great introduction to Paths Of The Dead, which shows the essence of Draugûl’s Music: epic and mystic Black Metal. Paths Of The Dead is a slow-paced track with a powerful rhythm section (with drum computer, I think; but that does not matter), varying vocals (abyssal grunts and grim screams, clean voices and spoken words), lots of changes in structure, haunting and atmospheric keyboards, fiery leads / solos, and acoustic guitars. It’s an enthralling piece with a focus on both melody and epic, and despite the tolkienish influences and the use of keyboards not another Summoning-clone again (though there is nothing wrong with sounding like Summoning, of course, but that’s a discussion not of importance right here). From The Ruins Of Angmar is more energetic and pushing-forward, and for sure much more heavy and epic (cf. the harmony choirs and the Viking-oriented riffs), but in general it comes with the same ingredients (different vocal styles, keyboards etc.). The next track, Ainulindale, is a shorter instrumental intermezzos, with acoustic and electric guitar leads. And that is the way The Voyager continues. It’s a collection of melodic, dark-atmospheric and epic Viking-oriented Black hymns with a great variety, and for such a young solo-project, I have to admit that the result is very interesting. With the second album (once again I want to refer to the upcoming review) things will be little more professional, but this is a nice debut for sure. Since I am a passionate fan of Bathory, I have to mention Draugûl’s interpretation of One Rode To Asa Bay (from the mighty Hammerheart-album) and Blood Fire Death (from the so-called album). Not once throughout history a band or project succeeded to do a Bathory-cover with a result stronger, or at least as interesting, as the original version. How should anyone ever be able to do so anyway? Also in this case the results stand miles away from the highly-qualitative original. I do appreciate the intention (it shows Hellcommander Vargblod is not such an idiot by showing he’s inspired by this Swedish Cult-project, and by paying tribute by re-interpreting Bathory’s fabulous epic), and I adore the fact that these aren’t just cover version that must sound as much as possible as the initial one, but that comes with an own interpretation. One Rode To Asa Bay is a cover in its totality, while the track The Curse Of Heoroth (with guest vocals by Katia Azzopardi) contains excerpts from Blood Fire Death. And there are much more riff- or melody passages that reek of Quorthon’s genius. Listen to the last track, The Barren Wastelands Of Ragnarok, with lots of links to the first three Bathory-albums (especially riff-wise); and the outro on that track, then again, is purely inspired by the Hammerheart / Blood On Ice / Twilight Of The Gods-era. A last word about the production. The sound is not bad, yet too dense and obtuse. Probably it is because of being recorded at this guy’s home studio, which cannot have the same opportunities as a professional studio (equipment and money, you see…).